FHA / VA / USDA One-Time Close construction loans are an important option to consider for those looking to build a new home in Texas. Texas home values have gone up 5.6% over the past year and Zillow predicts they will rise 4.0% within the next year. 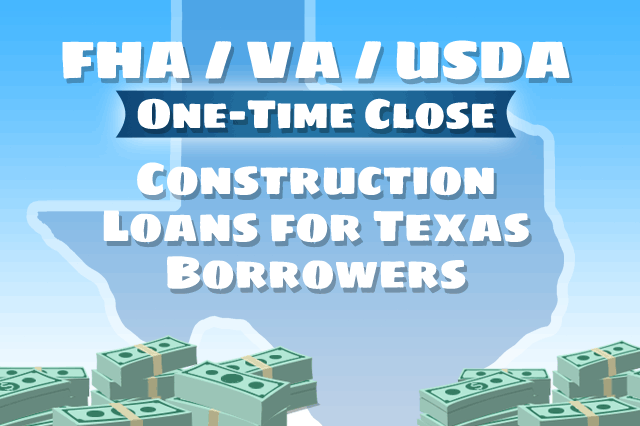 October 18, 2018 - FHA / VA / USDA One-Time Close construction loans are an important option to consider for those looking to build a new home in Texas. The Texas housing market is an excellent place to think carefully about building a home from the ground up with a One-Time Close (OTC) construction to permanent mortgage; A Zillow average home price report for 2018 lists the national average price at $218,000 with a predicted 6.4% increase over the following 12 months. For those trying to buy an existing resale home in some parts of Texas, the seller’s market may work against them, and the length of time a home sits on the market may be an indication that home prices in that seller’s market may be higher than some consumers care to pay. The persistent demand issue can also create an inventory shortage, which is one reason why borrowers may choose an FHA / VA / USDA One-Time Close construction loan to build a home to suit their needs rather than trying to find that one perfect home in a competitive marketplace. High prices, short inventory, what is a borrower to do? The State of Texas is broken down into 25 MSA’s or Metropolitan Statistical Areas which is a geographical region with a relatively high population density at its core and close economic ties throughout the area. In Texas, these are broken down into the following: Abilene, Amarillo, Austin-Round Rock, Beaumont-Port Arthur, Brownsville-Harlingen, College Station – Bryan, Corpus Christi, Dallas-Fort Worth – Arlington, El Paso, Houston – The Woodlands – Sugar Land, Killeen – Temple, Laredo, Longview, Lubbock, McAllen – Edinburg – Mission, Midland, Odessa, San Angelo, San Antonio – New Braunfels, Sherman – Denison, Texarkana, Tyler Victoria, Waco and Wichita Falls. FHA / VA / USDA One-Time Close Construction to Permanent Loans are offered for new site stick build housing, new modular construction and new manufactured construction. While the State of Texas is split into MSA’s, these Single-Close construction loans are available in all 254 Texas counties. OTC mortgages are a major improvement over the old construction loan process that forced borrowers to apply for not one, but TWO loans; one for the payment for labor, materials, and construction of the home and another loan that covers the actual mortgage. FHA / VA / USDA OTC loans have a single application and closing date.